Die Vlieënde Springbokkie (The Flying Springbok) is a South African, Afrikaans-language comedy sci-fi series which follows a group of mismatched South Africans stuck on a spaceship, on a quest to find a new planet. It's 2068, the Earth is overcrowded, and Mars was not what everyone thought. In the 2050s B-Earth or B-Planet, a replica of the present Earth, is discovered. A global race kicks off in 2066 to reach this planet first, so it can be ruled. After the Springbok united the nation with the World Cup, a group of scientists, phycologists and Aeronautical Engineers decided to build a spacecraft called The Flying Springbokkie to participate in the race. The diverse crew of six members has been selected according to their IQ (intelligence quotient) and EQ (emotional intelligence). This classification was established in 2028 when people are no longer classified by race, but according to their intelligence and their emotional strength. The whole country is behind The Flying Springbokkie, but this space trip does not go without the necessary drama, comic events and intrigues. What happens if the spacecraft experiences an unexpected setback, and the mismatched crew has to work together in a desperate effort to reach the newly discovered and highly sought after B-Earth? 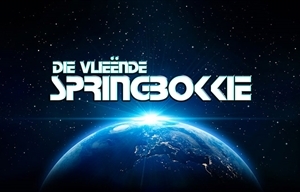 Die Vlieënde Springbokkie was created by Markus Davis and is produced by Urban Brew Studios with executive producer Adelaide Joshua-Hill and producer Burgert Müller. The script is by head writer Tiffany Barbuzano and the series director is André Odendaal. Original music is by Urban Rhythm Factory, Marshall Harmse and Leon Ecroignard. The title theme was sung by Pulane Sekepe. SABC2's new sci-fi comedy Die Vlieënde Springbokkie tops the bill, TAR returns to SABC3 and a Stephen King horror starts on M-Net.